Power has been switched on to the final section of the high-speed Channel Tunnel Rail Link (CTRL) ahead of the November launch of passenger services. Overhead cables between Ebbsfleet International station, Kent and London St Pancras were activated on Sunday. It allows testing of the track to begin but also prompted safety warnings. "We would strongly urge anyone thinking of trespassing on the line to think again," said Ben Ruse of CTRL operator London and Continental Railways. "There are 25,000 volts running through the cabling above the railway line. "It is extremely dangerous - 25,000 volts would offer you no second chances should you come into contact with that." It follows a similar warning in June, when it was revealed copper cable worth tens of thousands of pounds had been stolen by gangs breaking in to the Ebbsfleet construction site. The thefts, part of a national trend, increased as the price of scrap copper rose from £1,700 per tonne two years ago to £4,500. London and Continental said it was on schedule for the 14 November start date, when Eurostar's 186 mph hour trains will begin using Ebbsfleet. 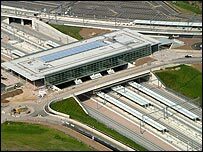 The opening of the St Pancras to Ebbsfleet section will cut journey times from London to Paris from 2hr 35 min to 2hr 15 min. High-speed domestic services will start operating between London and Ebbsfleet in 2009.